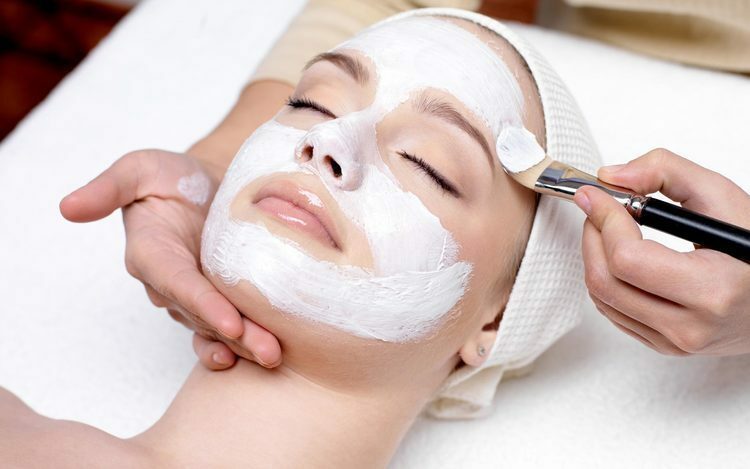 Your Esthetician will customize this facial for you based on your individual skin type and conditions.This includes cleansing, exfoliation and a mask to rejuvenate your skin type. Expanding upon the Skinplicity Organic Facial, you will receive a customized facial based on your skin condition. We add a paraffin treatment for your hands and feet to complete this very relaxing experience. Using only the highest quality fresh organic fruits, herbs and spices this facial gives you the best possible natural results. Let one of our highly trained therapists pamper and heal your skin with the scrumptious gifts of Mother Nature. This facial includes our Eminence Eye and LipTreatment. Based on the traditional European facial, this treatment is ideal for those suffering from oily, congested skin, and includes polishing brushes and extractions. The allure of fresh scents is inviting, but wait until you feel the difference that natural active ingredients like real Hungarian paprika, wild plum and apricot make. The Eminence paprika treatment offers a truly exquisite facial with products that are so natural you can see the fresh fruit pulp, seeds and smell the fresh herbs. It includes cleansing, exfoliation and a unique paprika masque along with a relaxing facial massage to smooth fine lines and relax both mind and body. Ask your Esthetician about our seasonal products! Enjoy a delicious puree of fresh fruits and vegetables which accelerate the exfoliation process to peel away dead skin cells, reducing pigmentation, fine lines and sun damage. The natural enzyme content increases collagen production and leaves skin feeling firm and radiant with increased elasticity. This is a real man’s facial using natural organic products especially selected for a man’s skin and individual needs. Using steamed towels receive a face, neck and hand massage with non-perfumed, non-greasy, natural products. This facial is wonderfully relaxing and fantastic for keeping a man’s skin in optimal condition. Glowing and radiant skin is yours in half the time! Designed to accommodate all skin types, this deep cleansing facial with extractions and facial massage will produce clean and healthy skin. Reap the benefits of a facial that will noticeably calm your rosacea and sensitive skin instantly! This facial is the perfect antecdote for your hyper pigmented and sun damaged skin! Our highly skilled massage therapists offer a variety of expert massage techniques for stress reduction, relaxation and pain relief. They’ll talk with you about your health and well-being to determine which type of massage would offer you the greatest benefit. This therapeutic technique uses deep pressure on targeted areas to release chronic pain. A special massage for the mother-to-be treats the common discomforts of pregnancy, such as low back pain. This massage cannot be performed during the first trimester. If you are short on time but in need of stress relief, this massage will return you to your busy life feeling refreshed! Our therapeutic body treatments are relaxing for both men and women. Through consistent treatment with professional products, our signature purifying, exfoliating and detoxifying treatments are some of the most effective ways to cleanse, balance, and moisturize the skin. Minerals from an underground thermal lake in Hungary have been boiling and fermenting for centuries, creating a highly potent blend of sulfur, spring water and phytoestrogens. These elements have been combined into an Herbal Mud Masque that is used to detoxify, purify and stimulate the lymphatic system, releasing toxins and excess fluids from the skin. The body is first dry brushed to loosen dead skin debris, cleansed and treated to an herbal masque and wrap. The body will get extremely spicy as its circulation increases. Cool water will rinse away all herbal extracts to reveal a firmer, more even-textured skin. A highly effective and stimulating treatment that can be done twice a week as part of an ongoing program for long term results. Extreme sensory pleasures are derived from this refreshingly chilled masque and warming wrap. Beginning with a light scrub for receptivity, a cool blend of stone crop, an exotic succulent historically used to increase the moisture content and health of all skin types is generously applied. Then a wrap of thermal blankets and hot towels is applied while your feet and scalp are treated to an acupressure massage. The uncommonly stimulating contrast of cool and warm is not only a delight to the senses but also exercises the skin on a cellular level. This body renewal is finished with a light massage of organic Stone Crop Whip Moisturizer for a radiant, replenished body. This spicy treatment uses Old World spices blended with delicious fruits and herbs to detoxify and smooth every inch of the back area. This treatment, along with extracts from the stone crop plant boosts hydration, the healing benefits of which will leave the skin silky and naturally beautiful. For those of us on the go! Scents of the season are revealed through this intense deep treatment starting with a fresh cleansing and added nutrition of our seasonal sugar scrub. Smooth your skin from shoulders to toes to reveal a dewy finish with our seasonal moisturizer.